"In recent years MOONDOG, the Viking of 6th Avenue, has perhaps become the ultimate musical cult figure. But Moondog has always been hip to those in the know. In the late 50s and 60s his fans and followers included Leonard Bernstein, Charlie Parker, Benny Goodman, Duke Ellington and Bob Dylan. In more recent years he's been celebrated by the likes of Damon Albarn, Jarvis Cocker, BMX Bandits, Philip Glass, Mr. Scruff, The Trashcan Sinatras and Teenage Fanclub. Here now, finally, reissued on glorious vinyl and CD editions is perhaps one of the rarest, most enchanting and eccentric albums of the whole Moondog canon (and that's going some). Perhaps the most extraordinary and unexpected thing about this album is that it features the voice of Julie Andrews. 'Tell It Again' was recorded in 1957 and so this is a pre-Mary Poppins, pre-Maria Von Trapp Julie Andrews. Although she wasn't yet an international superstar, she's still very much the Julie we know and love, prim and proper in manner and pure of voice. Also on board is English veteran of stage and screen Martyn Green. Andrews and Green take on the roles of adult children, reciting and singing nursery rhymes and playing games over a musical background that could only be the mighty Moondog. On 'Tell It Again' his unique use of percussion playing his signature rhythms and accompanying woodwind are as elegant and wild as ever. 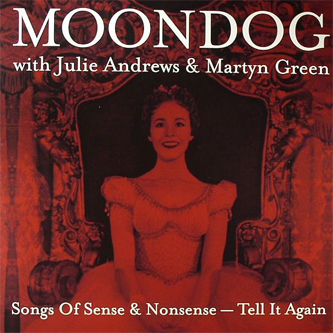 The sweet circular songs sung by Andrews and Green seem to be pointing the way to 1971's classic 'Moondog 2'. This lovingly re-mastered reissue with original sleeve notes (available from mid-November 2009 on vinyl, CD or download) is a must for all lovers of Moondog, of Julie Andrews and children of all ages."